As I read book 36, I knew exactly what my implementation will be and I am terrified. Not just the butterflies and jittery anxiety, but hair-standing-on-end, sweating, dizzy, gut-clenching terrified. I’ve known what I wanted to do since I was a young girl. And now it’s time to share with the rest of you. I don’t have an anecdote to share today, which is pretty dang ironic if you stop and think about it. I just have a plan; the implementation that has been weighing on me for a while. Reading each of the first 50 Dave Burgess Consulting, Inc books has been an amazing journey; one that has been filled with so much support, encouragement, motivation from my Professional Learning Network. Book 36, Stories from Webb by Todd Nesloney (co-author of Kids Deserve It) confirmed one of my deepest fears and my greatest hopes. Through reading this book, hearing the voices of Todd’s staff of Webb Elementary, tears running down my face or smiling from ear to ear, I am acutely aware of the effect of words on others. Words can inspire or tear down, portray compassion or apathy, impart wisdom or uncover ignorance. Writing has always been part of my life. I have never enjoyed it while doing it, but once the process was complete, I always looked back and was thankful I completed it. As a young girl, I would sit in my bedroom and write stories, three or four chapters long. It was always realistic fiction, but I couldn’t get the characters out of my head until I wrote about them. As a middle schooler, we were required to keep a journal and choose from hundreds of prompts to write an entry each morning. I shared that journal with some of my family who loved it (although I truly believe they are a bit biased). If I’ve ever needed to express my thoughts on a deeper level, writing has always been easier than speaking. When I’m thinking through a problem, I scribble a pro/con list. Through #DBC50Summer, I have realized that while the books are tremendous, and I do mean fantastic, my growth has only been in part because of the words written by these amazing authors. The majority of my growth has come through the written reflections on my practice and how I can improve through an implementation plan. As an adult, I dream about characters and their stories for multiple nights, then they just vanish (likely because I’m not writing them down anymore). My mom has always told me that she envisions me writing children’s books. Looking back, it’s easy to see why she would think that. Looking back is exactly what I have in mind. Hindsight. How many times have you wished you could go back in time for a do-over? It might only be 5 minutes, or even 20 years, that you’d like to erase, but the common theme is that we’d all like to have a redo in some moments of life. Reflection is such a major piece of education. Without reflecting on our practice, and on the stories of individual students, parents, colleagues, administrators, we become stagnant. 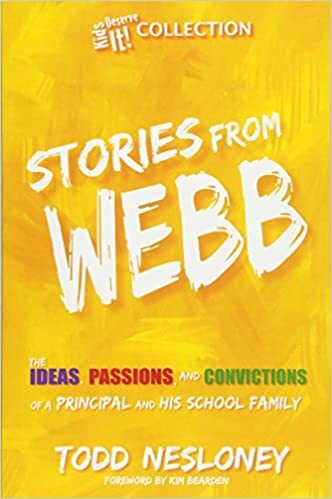 I love that Todd’s school family shared their stories within the pages of Stories From Webb. It was so powerful to read and connect with each one. I’ve alluded (several times) on Twitter to writing my own story. Are you seeing a pattern? My implementation? I’m going to write that book. A dear friend of mine and I have been tossing around the idea of writing an educational book for a couple of years. I definitely want to do that, but it doesn’t feel like it’s my story. It’s more of a how-to with resources. In one of those “shower moments” one day (they’re legit, by the way – check out Tara Martin‘s #3minPD on this topic), I just knew I wanted to write my story about my epic fails and how I responded to them. Think of it as a “what not to do” manual of sorts. Then, with more experience and hindsight, share what I should have done and what I would do in the same situation now. PS… it will be 20 chapters long… because you know. Hindsight is 20/20. I hope that you choose to be brave, love wildly, take risks, embrace the challenges, and most of all, remember that every moment is an opportunity to be better. It’s a scary thing, but just like my team and I did in this book, we need you to share your story! Write a blog, tweet it out, share it on Facebook, but get out there and share your brilliance with the world. We need your stories too. I hear you, Todd. The stories of your staff have inspired me; your stories touched my heart. You make me believe that even thought it’s insanely scary, I should put my story on paper. I will share my story. Even if it’s never officially published, I’ll share parts of it on my blog. Possibly the next blog series? #HindsightEDU? We’ll see. For now, I need to finish #DBC50Summer, read and blog the amazingness of books 51-56 (and the newest one by Tisha Richmond, Making Learning Magical – cannot WAIT for Tisha’s book coming mid-September), then no more putting it off. I keep making excuses for myself. I know that when I add this to my implementation plans for #DBC50Summer, I remove the ability to make excuses. For more stories from incredible educators around the world, jump into the #TellYourStory chat with Todd on Wednesdays at 8:30 pm EST. You can also follow along with others 24/7 using the same hashtag (As a note, #StoriesfromWebb as well as #KidsDeserveIt are also used to share stories)! Visit Todd’s website and grab a shirt while you’re at it! (Shirts are available the first week or so each month.) If you do nothing else, check out Todd’s amazing YouTube channel for episodes of #TellYourStory! Todd has hosted, as well as appeared as a guest on multiple podcasts. I’d suggest just doing a Google search for all of that awesomeness. This book is definitely worth picking up a copy! It’s one of those that you can randomly turn to any page of the book and be inspired and remember your why. It eliminates the feeling of loneliness that educators can sometimes feel as it reminds you there are others fighting the good fight, too! Go ahead and get your own copy; hurry! As always, there is a flipgrid for global collaboration and reflection. Thanks to Andrea Paulakovich for allowing me to copilot this insanely awesome idea she had! So fortunate to have met her through #DBC50Summer! Book 37 is The Principled Principal by Jeff Zoul (of Start. Right. Now.) and Anthony McConnell. This is one of the longer books. As I have zero interest in becoming an administrator, I’m interested to see how I might be able implement this one. I like a challenge, though. So… let’s get started. Feel the need to share a little awesome sandwich with you (posterity and all, you know) – the time Todd came to #ncties15 and I got to meet him & chat with him & Jennifer LaGarde. …and blogging first totally helps! You KNOW how to organize your thoughts. You KNOW the vulnerability of putting them out there… Start, Alicia. Simply start. Then keep going. Our best to you!